The simple rope tackle provides a 2:1 mechanical advantage and is frequently used to apply the desired tension to both hand ropes and foot rope—often on both sides of the bridge. 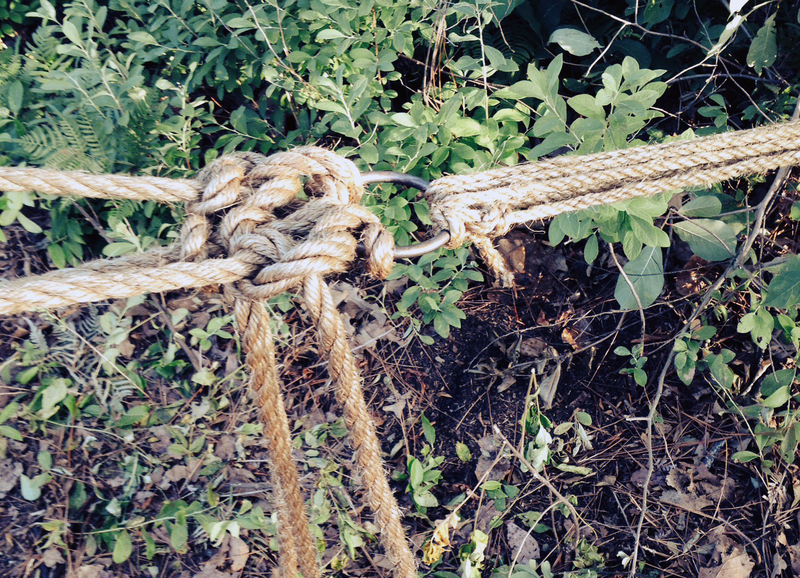 Adjusting the strain on individual ropes during use of the bridge can result in a slight complication—the spanner ropes can lose their symmetry. On the side of the bridge where the tension will be adjusted, the hand and foot Ropes are attached to one large ring. 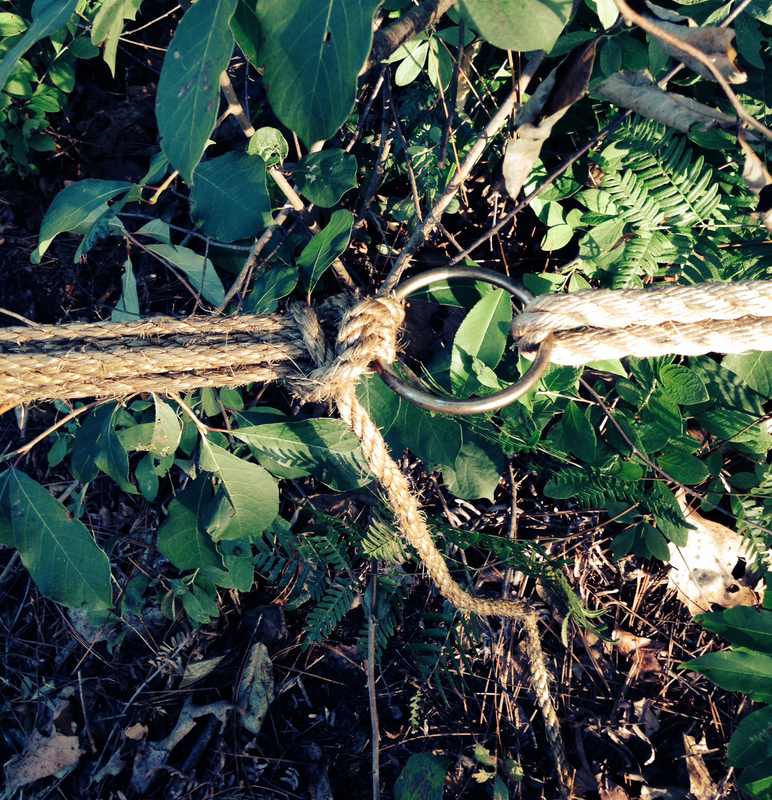 Use a roundturn with two half hitches to attach the hand and foot ropes to a rope grommet at one anchor point. At that side of the bridge, they will remain fixed. Pulling the three ropes so each receives the same degree of strain, attach each to one large ring at the other side of the bridge, again using Roundturns with Two Half Hitches. With a length of 1/4 or 3/8-inch manila (preferred), using a roundturn with two half hitches, connect one end to the same large ring. The other ring is in the rope grommet which is attached to the anchor. Reeve the running end of this rope through the ring in a rope grommet which is situated about four feet away and already fixed at the anchor point on this side of the bridge. To increase the strength of this connection enabling it to withstand all the strain exerted on the bridge during heavy operation, reeve the running end back through the ring in the rope grommet and then through the large ring two or more times. Now when you adjust the tension of the hand and foot ropes with this pull rope, the mechanical advantage is greatly increased. Secure the entire configuration with two Half Hitches cinched up against one of the rings. Some Notes: This arrangement can be configured any way you like, e.g. when using 3/8-inch manila, attach the pull rope to the large ring, reeve it through both rings twice, and then finally secure the configuration at the large ring. Or, instead of first tying the pull rope to the large ring (the ring that’s functioning as the moving block) initially tie it to the ring in the rope grommet (fixed block). Then proceed to reeve it through the other ring, back again, etc. With each turn on the rings, make sure the rope doesn’t cross on top of itself as this would interfere with adjusting the strain. This kind of rope tackle can exert too much force on the bridge components, so carefully monitor how tight everything is getting and don’t just give the rope a willy-nilly pull.